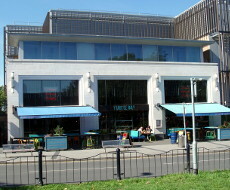 Turtle Bay, the Caribbean-themed restaurant chain, has a branch on Crawley High Street next to Morrisons supermarket. These hours were correct as of October 2018. It was reported in 2015 that Turtle Bay required its waiters to pay the company 3% of the sales generated by the customers each waiter served during each shift, with the money coming from each waiter’s tips. If the waiter’s tips were insufficient to cover the 3% charge, staff “will be required to make up the benefit of any shortfall in the next or subsequent shift,” according to a Turtle Bay employment contract seen by the Observer newspaper (see http://www.theguardian.com/lifeandstyle/2015/aug/23/restaurant-tipping-policy-forces-waiters-to-pay-to-work). This practice was reported to be still in operation in September 2018, at least in the company’s Bristol branch; see https://www.bristolpost.co.uk/news/bristol-news/turtle-bay-restaurant-bristol-staff-1980394.